Marcantonio Sagramoso is an Italian Chef, culinary professional of the world level, the youngest from the descendants of the dynasty of Counts of Sagramoso. He visited Ukraine as a Special Guest of InRestSummerFest, an international restaurateurs festival, which took place on June 19-22 in Odesa and gathered more than 200 representatives of the restaurant industry, more than 12 professional speakers and 30 events on the schedule. Marcantonio Sagramoso develops modern Italian cuisine based on ancient recipes & traditions, tinted with fresh ideas and topped with his creativity and talent. His dishes are enriched with traditional herbs and spices, a legacy from his Dutch mother, and infatuation with the aromas of Southeast Asia where he has traveled a lot in a search of new tastes and impressions. Passion for cookery takes its roots in Marcantonio's early childhood. Most of the time he spent in his kitchen and in a domestic library, busy with reading a great number of ancient culinary books. 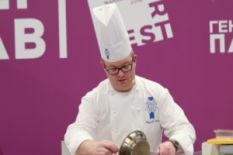 He then professionally studied culinary and gastronomy in different countries and has worked in prestigious restaurants in Italy for 10 years. Due to this solid professional experience and thorough knowledge, he was invited to a team of NIC (The National Italian Chefs). Later on, he became the team's leader and gained victory on the Worldchefs Cup and Culinary Olympics in Italy. Today Marcantonio manages his own restaurant "Le Cedrare" built in his domestic chateau near Verona. What is a story behind your way to gastronomy? Was it a childhood dream of becoming a chef or a more mature decision? After 5 years of secondary scientific school, I was fed up with going there. So I decided to approach the chef school in my town. I have always been interested in making food since I was a child but everybody in my family wanted me to have a good education before going to a cooking school. So when I decided to try to become a chef, I was very happy - after the school, I was traveling around the world (Germany, Switzerland, USA, Caribbean etc). I decided to gather my experience and impressions to open a restaurant on my property near Verona. You are from an old Senior dynasty. Does your family have a special gastronomy and high-grade traditions, rituals? My family has 1000 years of history - its main recipes are written in an old book, stored in a secret box in the villa. Many of these are written in archaic Italian and are very difficult to translate for me too. But I have already translated several recipes to modern Italian. What are the main principles of Chef Marcantonio Sagramoso? After everything I write down my experience and impressions, I pair up all these with my knowledge to build my way of cooking that is based on our classical tastes but done with modern concept and technologies. Often when you try to convert the old recipes into new ones, it is frustrating because cause food cooked in a new way has different flavors than cooked in the old ways. What are your impressions of Ukraine, its culinary traditions and restaurant culture? Ukraine...it's the first time in my life that I come here. I have a very good impression of your chefs and people that work in this branch. Many of them want to know more and more and this is a good thing in order to improve gastronomy in Ukraine. Globalization makes the rest. I had been to two restaurants and I have seen an important Jewish influence, which brings many different flavors in your gastronomy and makes it very interesting because I didn't expect this influence. What was your motivation to take part in InRestSummerFest’2018 as a speaker? What are your impressions and what did you get from this experience for yourself? I have many friends in the industry worldwide. 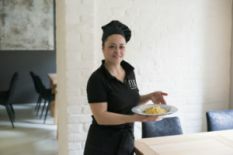 It was Lesya Suchenko from “Novy Project”, who invited me to participate in the InRestSummerFest after she and other chefs from Ukraine came to visit my restaurant last winter. For me, it has been a very nice experience. Every new thing is a small brick to put in my wall of experiences. Photos provided by Marcantonio Sagramoso.